This is going to be an exciting Family fun event with great music and a nice 5k and 1k route starting near the Port of Beaumont. THIS EVENT IS FOR EVERYONE SO BRING THE WHOLE FAMILY!!!! 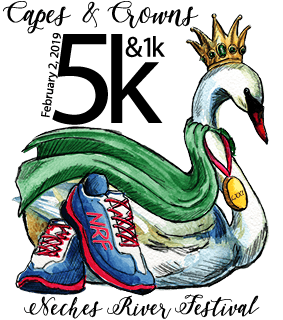 Join us for this year's first inaugural Neches River Festival Capes & Crowns 5k/1k, February 2, 2019, 8am, Port of Beaumont. This year’s Festival, April 1-13, 2019, theme of “One River, One Community” will celebrate our shared region, rich in history and resources. The festival provides opportunities for our youth to learn more about or community, develop skills that will help them in the work place. Participants in the Festival may apply for one of two scholarships awarded each year through the Neches River Festival Otho Plummer Scholarship. All Festival participants, including Princesses, Duchesses and Escorts are eligible to receive the scholarship. You can visit our website at www.nechesriverfestival.com to learn more. Race Day Registration: February 2, 2019, 6:00am - 7:30am, please note that same date registration may limit your selection on t-shirt sizes and/or overall availability.